But at that point I was told to leave the room, that what was coming was unsuitable for a boy my age. My frustration was compounded by several friends and acquaintances at school the next day who insisted on talking about having seen the movie. I’m not certain now when I actually did get to see Psycho from beginning to end. There was a theatrical screening sometime in the late ’70s or early ’80s, but it’s possible I’d already seen it on TV by then. Certainly, I’d read a lot about it. I’d probably already read Robert Bloch’s novel by that time. 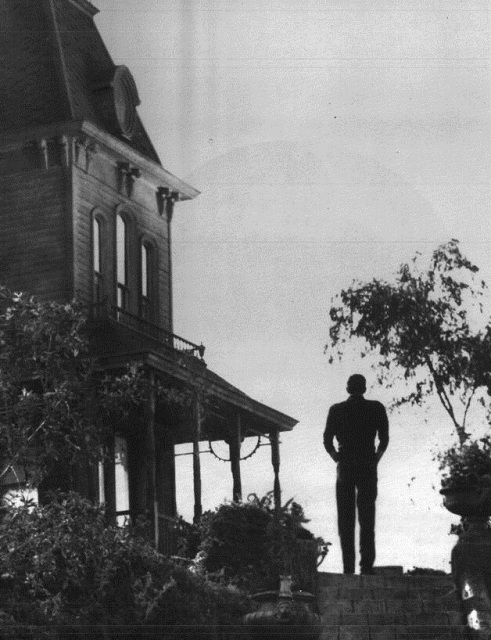 In any case, by the time I did finally see Psycho, I had a distinct sense of deja vu – I already knew everything there was to know about it and my first full encounter already had an air of ritual re-visitation about it. Of course, since then I’ve seen it many times – on TV, on VHS and laserdisk and DVD. Alfred Hitchcock’s tricks and strategies are almost comfortingly familiar: the structural disruption of having the ostensible protagonist abruptly killed part way through, the subsequent narrative destabilization resulting from the shifting focus among several seemingly secondary characters – Lila and Sam, Arbogast, and of course Norman himself, the twitchy, mother-burdened young man who unexpectedly gains much of the audience sympathy thanks to the harsh off-screen personality of the old lady. But as much as I’ve appreciated Psycho over the years, it seems paradoxically that I never really got to experience it for a “first time”, certainly not like someone who walked unsuspectingly into a theatre in 1960, not even as I might have done if I hadn’t been banished from the living room in 1968 or ’69. Not, that is, until quite unexpectedly last week, here in Winnipeg, did I seem to meet Marion, Lila, Sam, Arbogast and Norman for the first time. I almost missed the experience and would have if not for a friend’s urging. Cineplex is currently running a “classic movie” series – a different movie each month, digitally projected on the big screen at a bargain price. The 2K digital projection of Psycho probably looked better than anything short of a new 35mm print fresh from the lab. Although some of the wider shots seemed a little soft, most of the film was luminously clear, every detail and nuance there to see as if for the first time. I was hooked from the first frame, drawn in by Hitchcock’s assured control, every shot adding telling detail to the narrative, every glance and motion of the characters building a singular monument to the power of storytelling. It was an education in the use of relative shot size, camera placement and movement, cutting rhythms, which threw into sharp relief the almost random nature of contemporary film craft – Hitchcock’s closeups have a remarkable visceral power which really doesn’t come across when watching the movie on a small screen. That low-angle shot of Norman in the scene with Arbogast, as he leans in over the camera to look at the register, comes as a shock, an abrupt revelation of the predatory, bird-like nature of the character, strangely weighted with equal measures of humour and menace. I had entered the theatre expecting yet another dutiful iteration of a classic, a rote attendance at the altar of the acknowledged master, only to find myself gripped by a fresh, living piece of movie art which made me acutely aware of just how unengaged I’ve been as a movie-goer in recent years, how little most movies have to offer me these days. And by the end (past the painful and unnecessary scene with the psychiatrist’s explanation), when Norman/Mother looks out at us with that death’s head smile, I realized that I’d been reminded of why I’d loved movies in the first place. I felt excited and revitalized (and kicked myself for not having gone to see the screening of Casablanca last month). Whatever technical developments might come along, no matter how flashy technique has become, for me it always has, and still does, come down to story and character and the plain art of storytelling. At it’s best, that was where Alfred Hitchcock’s technique was so sharply focused. Never a wasted gesture or unnecessary effect, everything in service of that core purpose – to grab you, draw you in, and hold you in a tightening grip. As for his reputation for not caring about his actors, the performances of Janet Leigh and Tony Perkins offer a powerful counter-argument. These two give the performances of their lives in Psycho and the scene in the back room of the motel office, over a sandwich and surrounded by stuffed birds, is as good as the movies get. This entry was posted in Commentary and tagged Alfred Hitchcock, Classics, Horror. Bookmark the permalink.